A study of mothers-in-law and daughters-in-law finds the relationship is often not that bad. No, really! Readers of Salon's Since You Asked advice column are very familiar with the, ahem, strong sentiments that some daughters-in-law have about their mothers-in-law. One woman used various forms of the word "resent," including "resentment" and "resentful," no fewer than 10 times in her letter to columnist Cary Tennis when describing her feelings about her husband's mom. Another agonized about her financial future being jeopardized by her impecunious mother-in-law. A nine-months pregnant mom fantasized about suffocating her mother-in-law with a diaper, while another homicidal daughter-in-law wrote: "I want her to die. Violently. Now. And I want her to see it coming." But mothers-in-law take heart! It's not all resentful, resenting, resentment with a side of murderous rage out there. 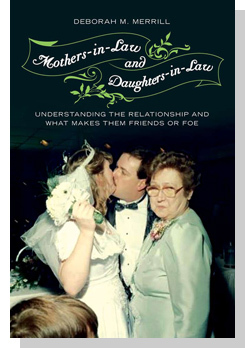 According to Deborah Merrill, associate professor of sociology at Clark University, who is the author of a new book called "Mothers-in-Law and Daughters-in-Law: Understanding the Relationship and What Makes Them Friends or Foe," many MIL and DIL relationships are really not that bad. For her book, Merrill interviewed 53 daughters-in-law and many of their mothers-in-law in central Massachusetts. She found that a third of the daughters-in-law -- who usually are more negative about the relationship than their mothers-in-law -- described their relationships with their husbands' mothers as "tightknit." Forty-two percent of the daughters-in-law said that there had been no conflict with their mothers-in-law in their marriage. And almost half said that they felt that they could confide in their mothers-in-law. Merrill also found that this relationship often improves over time. Even so -- as the Since You Asked columns attest -- she observed that when this relationship is bad, it can be really, really bad, with very high levels of conflict and, yes, resentment. Why do you think that the archetype of the interfering mother-in-law is so pervasive? It's the result of the fact that the mother-in-law has always been her child's main caregiver. It is hard to turn that mothering role off just because a child gets married. The continued concern and drive to advise is seen as interference, though, once a child marries and has their own family. Relinquishing one's role can cause resentment on the part of the mother-in-law, particularly if this has been an important source of her identity. What was the worst mother-in-law and daughter-in-law relationship in your study? There was one couple that lived with the husband's mother for financial reasons, but there was extreme conflict between the two women and little support for either from the son/husband. "Sally" shook with rage as she told me about her relationship with her mother-in-law. She went so far as to say that she fantasized about killing her mother-in-law and wished that she were dead. According to Sally, her mother-in-law had also performed overt acts of hostility. Her mother-in-law was not willing to be interviewed, though. The most heartwarming stories were the women who had relationships that were similar to a quasi-mother and daughter bond. Several of the women had very distant relationships with their own mothers, or had lost their mothers early on in their lives but felt like their mothers-in-law were like second mothers. What was the role of the sons/husbands in these relationships? The majority of the sons/husbands did not get involved. This was extremely frustrating to the daughters-in-law who wanted their husbands to "stand up for them" or "take their side." Instead, husbands told their wives that they should just ignore the mother(in-law)'s comments and not let the mother-in-law bother them. This was often an extension of how the sons had handled problems with their mothers in the past. Daughters-in-law found this more difficult to do. Those few sons who did interfere told their mothers either that their wife was their priority now (rather than her), or that their mother-in-law needed to interfere less. What makes these in-law relationships hard? The marriage of a son is a life course transition for which many families are not prepared. This results in conflict early on in the relationship that in-laws are never quite able to overcome. When a son marries, a new and separate family is created. While the daughter-in-law is trying to create her own family, her mother-in-law is trying to maintain relationships in her family as they have always been. Unlike many other family relationships, there are no shared expectations of an in-law's role and obligations in the family. Instead, expectations differ from family to family. Some of the daughters-in-law expected that they would be treated just like daughters and welcomed into the heart of the family because that was how their sisters-in-law were treated. However, they may marry into a family that focuses just on biological connections and feels no need to include in-laws. This makes it hard to know how to interpret (and thus misinterpret) their in-laws' actions. People feel disappointed and left out if other people do not meet their expectations, or if more is expected of them than seems comfortable. Mothers-in-law and daughters-in-law are expected to treat one another like family without the benefits of a mother-daughter tie. They have neither a shared history nor the unconditional love that balance the obligations of family ties. In-laws are expected to share their homes during visits, to share holidays, offer resources and help, and to love one another. These things are particularly difficult to do, though, during the first years of marriage, when in-laws are still strangers, and may continue to be difficult if there are incompatibilities. What advice do you have for mothers-in-laws and daughters-in-laws on how to make their relationships work? Include them in your family. The mothers-in-law's main complaint about their daughters-in-law was that they often felt like they were on the outside of their son's life looking in. Mothers-in-law want to be included, and the daughter-in-law needs to bridge the gap and make her feel welcome. Daughters-in-law were much more likely to have good relationships with their mothers-in-law later on if they felt welcomed into the family from the beginning. Acknowledge your son and daughter-in-law's marriage by including her in your relationship with your son whenever you can. These two things will go far to improving a relationship.